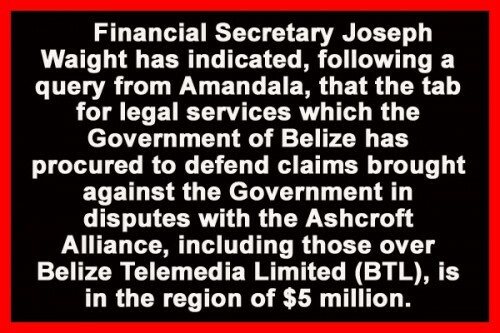 Financial Secretary Joseph Waight has indicated, following a query from Amandala, that the tab for legal services which the Government of Belize has procured to defend claims brought against the Government in disputes with the Ashcroft Alliance, including those over Belize Telemedia Limited (BTL), is in the region of $5 million. More specifically, litigation spanning 2009 to 2012 has cost the Government roughly BZ$4.8 million. Among the pending disputes is that over the very nationalization of BTL, for which judgment is due to be handed down by the Court of Appeal. However, there is also foreign arbitration pending over the US$22.5 million loan that the Government compulsorily acquired from British Caribbean Bank when it nationalized BTL. The Caribbean Court of Justice recently ruled that the dispute can proceed to arbitration, notwithstanding pending litigation before local courts.